Re-live the best play of Sunday's win. Doug Pederson was standing at the 33-yard line, to the right of the Eagles’ offense. The line of scrimmage was the 27-yard line. It was third and eight. Carson Wentz took the snap from the shotgun, Darren Sproles lined up to his right, hands on his knees. Wentz took a three-step drop, looking left, and the Steelers’ Stephon Tuitt swam around Allen Barbre with a bead on the Eagles’ rookie quarterback. “I was actually reading the other side of the field, and I saw someone from the Steelers step across my face,” Wentz said. It was Tuitt, a white-and-yellow blur flying across Wentz’s line of sight. He faked a pass at the 29-yard line, two yards behind the line of scrimmage. It gave the Steelers’ Cameron Heyward a slight pause, an extra half-second for Wentz to figure out what to do. “I saw Carson scrambling this way, and Darren was literally right in front of me,” Doug Pederson said. Wentz looked at his options. He said after the game he was borderline ready to run it. He decided Sproles was the best choice. Pederson knew what Wentz was thinking. Pederson was just hoping Sproles hadn’t stepped out of bounds already. Pederson checked, and he hadn’t. The next two seconds, Pederson said, played out in slow motion. “He just floated that ball up the sideline,” Pederson said. For Wentz, it was a no-brainer. He said he always likes connecting with the veteran running back. 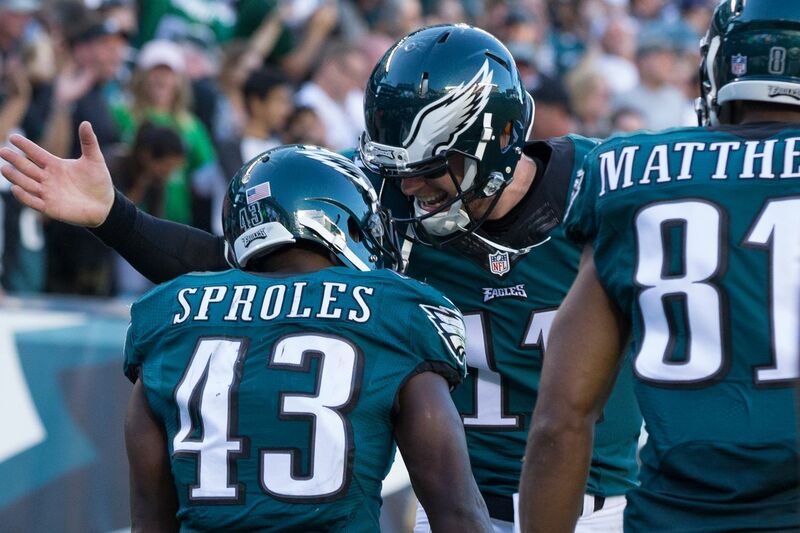 Sproles caught the ball at the 48-yard line. He sprinted down the sideline, cutting back once at the opposing 40-yard line against Sean Davis, and then again at the 17-yard line, once again against Davis, and then once more at the seven-yard line, this time against both Davis and Artie Burns. Doug Pederson looked back towards the line of scrimmage, as he always does on long plays, to make sure there were no flags on the ground. Carson Wentz’s view was obscured by a portly man with a big beard. What a highlight it was.